Elon Musk’s hyperloop looks pretty neat. But it will be challenging to implement, even if all the technical and financial problems are easily solved. If you haven’t looked at Elon Musk’s prospective plan for the Hyperloop yet, you should. It’s a fascinating if somewhat far-fetched proposal for high-speed surface travel between San Francisco and Los Angeles which resembles the futuristic vacuum tube transportation system often popular in the 1970s, but it is made a bit more feasible by the fact that the tube is not a perfect vacuum. To avoid the buildup of air on the front of the vehicle, a mechanism resembling a jet engine intake will redirect the air from the front of the vehicle to the underside, where it will be used to provide a cushion of air levitating the vehicle a few millimeters above the bottom of the tube. Solar panels on top of tue tube will allow the system to be self-powering, and the projected journey time from San Francisco to Los Angeles will be a mere 35 minutes. Reactions to the hyperloop have ranged from excitement to skepticism to outright dismissal. I can’t comment with any authority on the technical or financial aspects of the proposal, as I’m neither an engineer nor an economist. But I can talk a bit about other aspects of a hypothetical transition to a hyperloop-based transportation system. Transitions theory, or at least the subset of it that I work with, suggests six major aspects of the current transportation system that the hyperloop would have to contend with: Science, technology, finances, markets and user preferences, policy and culture. I’m going to consider the hyperloop from each of these perspectives. I’ve grouped these two facets of the system into one because in the case of the hyperloop, they both amount to roughly the same question: What research would have to take place in order to make the hyperloop more technically feasible, and how much capacity exists to carry out this research? The concept of technological trajectories comes into play here. Once businesses, policies, and society at large come to an agreement that a particular technology is the solution for a particular problem, research efforts in both science and technology will focus on questions relevant to that technology. When the car became a dominant means of transportation, for example, it spurred research on internal combustion engines, tire traction, safety glass, road surfaces, and a range of related problems. Research labs were built, and university programs founded to study these things. The hyperloop does not have the benefit of any such structures. So we need ask how much we actually know about things moving at supersonic speeds on air cushions in small confined spaces? If, as I suspect, the answer to that question is “not much”, then Musk will have to work hard to attract the right minds away from more traditional forms of transportation and towards his system. This one is pretty obvious. Musk estimates that they hyperloop will cost around 4 billion US dollars, though this figure has been hotly contested. If he funds this privately (see the policy heading for the public route), then he will need to convince investors that the hyperloop can provide a decent rate of return. This will be difficult, as no such thing has ever been built before. I have a brainstorm about this problem: Build the first line to Las Vegas, rather than San Francisco. It would make a party weekend in Vegas far more convenient for Angelenos, and its novelty might fit in well with the Las Vegas party culture. This approach could attract some financial support from the casinos, who have fairly deep pockets and have a strong interest in bringing people to their isolated city more conveniently. If the hyperloop performs as advertised, then it should function pretty well in the market. Elon Musk claims that it will be both faster and cheaper than trains and cars. If this is accurate, then it should function well in a purely economic sense. The biggest problem I can find here is the last mile problem, which concerns the problem of moving passengers between local travel hubs, such as airports and train stations, and their specific origin or destination points. The hassle of the last mile has given travellers a preference for door to door transportation, which is normally provided by a private automobile. The hyperloop will have to contend with this. The plan to have a larger version that can carry cars onboard is a clever idea, but it will undoubtedly be more expensive and probably harder to load than the pedestrian only version. The Hyperloop should therefore be well connected to existing urban transit networks, if it is going to seriously compete with cars. This is a big one. Musk wants to build the hyperloop down the length of California’s Highway 5. That means that multiple government agencies, as well as the California State congress will almost certainly be involved. Of course, this will be even more the case if Musk is hoping for any sort of state subsidy. Even if the route gets changed, the hyperloop will almost certainly be fighting an uphill battle for basic regulatory approval. It is therefore useful to think about what kind of interests might try and use policy as a way of opposing the hyperloop. Airlines will probably have something to say about it, as will car manufacturers, oil companies, and highway maintenance companies. Musk and his allies are unlikely to have the resources to contend with these entrenched interests, so the hyperloop will need a massive groundswell of public support to be accomodated by the relevant regulatory bodies. Americans really like their cars. So strong is this force in American culture that some scholars have gone so far to describe it as a “cult of the road”. And within the United States, the cult of the road is unlikely to be much stronger anywhere else than it is in Southern California, which is probably the most car-dependent place on Earth. Cars are seen as symbols of masculinity, independence, and American patriotism, and the road trip is something of an American institution. So it might be hard to convince Californians to abandon their cars for a big tube. The high-tech novelty of the hyperloop system will be somewhat useful in ameliorating this problem, but it will probably be insufficient on its own. I think that the most important thing that Musk could to to get over this cultural barrier is to ensure that the tube is transparent or has some kind of window. This will highlight the speed of the hyperloop in relation to the surrounding traffic in a very visceral way, which will likely have a positive cultural impact. There is one other factor worthy of consideration here that does not fit into any of the categories above: that of celebrity. The initial surge of publicity enjoyed by hyperloop is evidence that Musk has considerable personal clout. It is worth remembering that many of the technological systems we currently take for granted were initially created by well-known public personalities such as Henry Ford, Thomas Edison, Isembard Kingdom Brunel, and Nicola Tesla. More recently, figures like Steve Jobs, Larry Page, and Bill Gates have ushered in the computer revolution. Whether these peoples’ fame is a result of the systems they built or their systems are the result of their fame is hard to say, but perhaps celebrity is a positive influence on the growth of radical new technologies. I don’t think there has been any research done on this, but it is well worth looking into. I have to conclude that the ultimate success of the Hyperloop is unlikely but not impossible. There are a number of very challenging obstacles in its path, but the right combination of celebrity, public support, technological novelty, luck could make it a reality. Even if the hyperloop fails, we shouldn’t be so quick to dismiss such radical ideas out of hand. Every single technology we take for-granted today was far-fetched at one point in history. We have always needed dreamers like Elon Musk, and with the present need for a more sustainable society, our need is greater than ever. Apparently it tasted a little dry, but on the up-side, this hamburger could help save the world. Hamburgers, tasty though they may be, are rarely newsworthy. Last week, however, there was a fairly interesting exception to that rule in the form of the first ever completely synthetic hamburger. 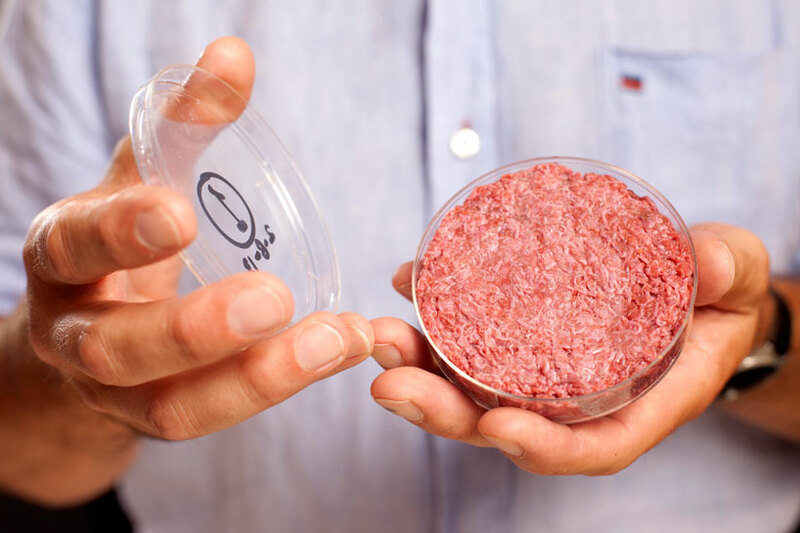 That means that no cattle were harmed in the production of the burger’s patty; it was made of tissue grown from cow stem cells in a lab. There’s been speculation about this kind of process before, but this is the first time anybody has turned the idea into something you can actually put on a bun with lettuce and serve with a plate of chips. While we should probably admit that using biotechnology to grow animal parts independent of the animals that sustain them is normally the subject of some very pessimistic science fiction, we shouldn’t let these misgivings stop us from appreciating the potential of this technology. The meat industry, which this technology could reform or completely replace, is one of the most resource-intensive on the planet. The meat industry is the source of a significant percentage of global greenhouse gas emissions, as well as other forms of pollution such as manure. It also takes up enormous amounts of land, and it is the site of some of the most barbaric cruelties we human beings inflict on any other creature. It seems obvious that our consumption of meat is a significant threat to the environment. That being said, the dream of a purely vegetarian or vegan society is likely to remain just that for at least another century. PETA campaigns may be convincing more and more people to eliminate animal products from their diets, but the vast majority of the population still eats meat and seems largely unconcerned with the ethical and environmental problems of the meat industry. While some of these people might be persuaded to adopt a less radical dietary change such as Meatless Mondays, it seems likely that people will continue to eat meat for some time to come. Given that, this artificial burger seems almost too good to be true. If high quality artificial meat can be produced on a large enough scale, then we can enjoy steaks that require no cruelty to produce. It’s also probably fair to speculate that the environmental impacts of such an industry will be considerably less than those of the meat industry it would replace. Bio-industrial facilities can be stacked to take up less land, and can be built locally to save on transportation costs. Furthermore, I suspect that it will be much easier to control the emissions of a vat of proteins than of a one ton animal with legs and free will. That being said, I think there’s a very large potential obstacle in the way of this technology that comes from a somewhat unlikely place. I am referring to the environmental movement. On the face of it, one would not expect environmental activists to oppose a technology with such obvious environmental benefits, but it’s important to consider the ideological background of modern environmentalism. The contemporary environmental movement originated in the 1960s and 1970s, and is grounded in a fairly legitimate reaction to the growing centralizing technocracy and consumer society that was existed at the time. The environmental movement thus has genealogical ties to the 1960s peace movement, the antinuclear proliferation movement, and a whole host of other activist traditions originating from the hippie generation. This can be seen in some of their political positions. Nuclear power, genetically modified crops, and industrial agriculture are opposed partly because these technologies are best suited to a centralized, expert-driven technocracy that environmentalism grew up in opposition to. Conversely, things like organic food and small-scale wind power are promoted by environmentalists because they are relatively low-tech solutions that promote resiliency, self-sufficiency and democracy. It’s unlikely that anybody will figure out how you can grow your own meat at home. Even if the necessary expertise could be somehow developed in a radical permaculture commune, there is still the question of where they would get bovine stem cells. These complications mean that synthetic meat is likely to take the form of a centralized, expert-driven industry for the foreseeable future. And that doesn’t fit in very well with the visions promoted by environmentalist organizations. I don’t mean to suggest that all the objections these organizations might have are inherently wrong. Indeed, their skepticism might allow them to uncover some environmental danger or health threat associated with fake meat that gets missed by others. But as we negotiate the kinds of new technologies that could make our food system more sustainable, we need to think critically about why activists take the positions they do, keeping in mind that everybody has their own little dogmas and irrational biases. There is no such thing as a purely rational political actor. I could end this post there, but I think there’s one other trend I should note that could be relevant to this debate. As I’ve said, mainstream environmentalism takes the positions it does because of its roots in the social movements of our parents’ generation. While younger people have internalized those values, mainstream environmentalism remains in one sense a baby boomer’s movement. But as milennials begin to assert themselves in activist circles, we’re starting to see them developing an alternative perspective, which is informed by the political importance of the internet-itself a fairly technocratic space that requires the central provision of some crucial resources. While the hippies generally seek to simplify the world by avoiding and opposing centralized technocracy, adherents to this new philosophy are better described as “hackers”, who seek to directly engage with complex systems, subvert them, and bend them to their will. This, I suspect, will lead to a different set of environmental values, under which fake meat could very well be seen enthusiastically as an environmentally beneficial bio-hack. When one can talk about generational activist infighting over fake meat, it becomes obvious that we live in a very strange and exciting world indeed. An unlikely illustration of the impact of discursive conflict on transit development. Guest-starring Leonard Nimoy! I haven’t yet really explained what my PhD project is on this blog. To describe it as briefly as possible, my research will look at how cultural and political conflict influenced the competition between road and rail transport in the United States and the United Kingdom during the twentieth century. This is an important because cultural factors in transition processes are not well understood, and more research on the role they play could prove important for efforts to transition to more sustainable technologies in transportation and in other areas. This explanation is a bit jargon-y, though; I like to think that I try to reach beyond the ivory tower, and so a simpler explanation, possibly involving a reference to a beloved American cartoon, is in order. Luckily, about a week ago I thought of the perfect way to relate my work to none other than The Simpsons. Marge’s view is eventually vindicated when it turns out that the monorail salesman was planning to abscond to Tahiti with the city’s money after installing a dangerous monorail system riddled with engineering flaws. Homer, who has become a monorail conductor, narrowly avoids a tragic accident on the opening day. The connection between Marge and the Monorail and my research can be found in the implicit assumptions that come out in the musical scene. While neither the citizens of Springfield nor the episode’s audience knows at this point of Lanly’s true intentions, the tone of the scene suggests quite clearly that the monorail is a bad idea and that Lanly is not to be trusted. At the start of the scene, Mayor Quimby sets the tone by for a “gullible townsfolk suckered by salesman” narrative by declaring that they will vote for anything Lanly proposes. Marge, who is typically portrayed in the show as a voice of reason, complains that the town’s existing road transportation network is in a state of disrepair, but she is quickly shot down by Bart, who points out that “the mob has spoken”. The framing of the townspeople as a “mob” further underlies the assumptions that are built into this scene: The monorail scheme, while exciting and new, is dangerous and impractical, and the townspeople would be better off listening to Marge’s boring yet pragmatic plan to fix Main Street. But why anybody unaware that the monorail is a scam accept that Marge’s idea is more pragmatic? By providing cheap and efficient mass transit in and out of downtown Springfield, an effective monorail system may indeed have made the condition of Main Street irrelevant. Had it performed as advertised, Lanly’s scheme would almost certainly have transported more people for less money in a more environmentally friendly and less spatially intensive way than the roads that Marge wanted to repair. Marge’s skepticim does not come from a suspicion that Lanly’s cannot be trusted, but from a belief that personal automobmile transport should be prioritized over flashy public transit schemes, and can be interpreted as a reflexive defense of private motorized transport over a new public transit scheme. The framing of the scene suggests that Marge’s view is the most reasonable. At this point we need to step outside the narrative of the show and keep in mind that The Simpsons rarely courts controversy. It is likely that the writers of Marge vs. the Monorail expected the audience to sympathize with Marge’s perspective. The episode, in other words, reflects a view on the part of both the the production team and the majority of the audience that road construction and maintenance is a pragmatic necessity that is a basic responsibility of city governments, while public transit schemes are risky extravagances. In this sense, the episode reflects the attitudes towards transportation that were prevalent in the time it was written; an audience from the early twentieth century watching Marge vs. the Monorail would find the whole thing highly suspicious. To them, Marge’s skepticism would come off not as cautious pragmatism, but as an elitist civic bias in favour of the infrastructure used only by the wealthiest of Springfield’s citizens. While they would not necessarily sympathize with Lanly monorail salesmen (public transit companies were often understood to be profiteers), they would also wonder why nobody at the meeting challenged Marge on her obvious class bias. What we can learn from a critical analysis of Marge and the Monorail, then, is that at the time it was made there was a powerful discursive bias against novel public transit schemes. It is easy to imagine how such a bias would be consequential; as long as voters and consumers share Marge’s attitudes then it will be very difficult to push forward any new, efficient public transit schemes that could hold the promise of making our transportation system more sustainable. Marge Simpson, to put it bluntly, is standing in the way of sustainability. But it’s equally clear given the history of transportation that Marge’s attitudes are not timeless, but became commonplace at some point in the twentieth century. At some point over the course of the twentieth century, a major change in the public understanding of transportation networks occurred. Understanding when, how, and why this change occurred has implications far beyond The Simpsons; it can inform how attitudes towards monorails and similar projects might change in the future, and is therefore very important for bringing about sustainable mobility. My research focus is not perfectly illustrated by “Marge vs. the Monorail”. This episode focuses on an urban public transit scheme, while I focus on the ongoing competition between road and rail for intercity travel. My research also includes the United Kingdom in addition to the United States. But Marge’s criticism of the monorail is a good illustration of the attitudes I want to understand. I want to know how Marge and others like her came to reflexively prefer private cars over public transit; what impact that had on the development of transportation systems during the twentieth century; and, by extension, how such attitudes might change again in the future. If we always prioritize fixing Main Street over building the monorail, then we will have trouble making any serious dent in car use, and we will therefore be stuck with carbon emissions, congestion, traffic accidents, pollution, peak oil, and a whole host of other problems. Overcoming Marge’s skepticism about a fictional monorail is a crucial requirement for making our real-world transportation system more sustainable.